This premium grade, twinwall fluted plastic sheet offers efficient solutions to a wide variety of applications. Please note this product is not manufactured by Correx, but is our own brand, premium equivalent and offers improved crush resistance and rigidity compared to ordinary Correx sheet. 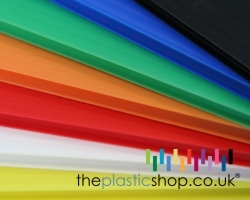 Our standard grade corrugated plastic sheet has a fine flute and comes in a standard 4mm thick / 700gsm weight sheet with a great selection of colours available to buy online: Black, Blue, Red, Translucent, White and Yellow. Any other colour can be made to order! Also available is 6mm thick corrugated plastic sheet, 8mm thick corrugated plastic sheet and our thickest stock sheet 10mm thick corrugated plastic sheet. Our floor protection sheet grades are an industry leading 2.5mm thick / 350gsm offering advanced surface protection - and is available in Premium and Premium+ FR (fire-retardant) grades. Ideal for floor and surface protection in buildings. 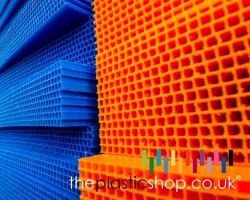 We also offer our ProTect board: a foam laminated plastic sheet - providing enhanced surface protection to one or both sides of the standard sheet.